VIDEO: Star-Spangled awesome! 10-year-old lawn mowing entrepreneur asks President Trump if he can mow White House lawn. Prez says yes! 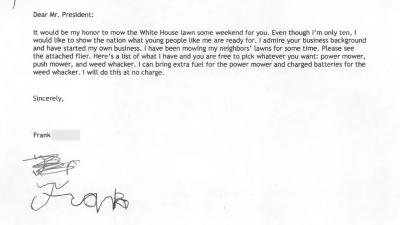 Ten-year-old Frank from Falls Church, Virginia, just outside of Washington, is a lawn mowing entrepreneur. He wrote to President Trump requesting an opportunity to mow the White House lawn some day. 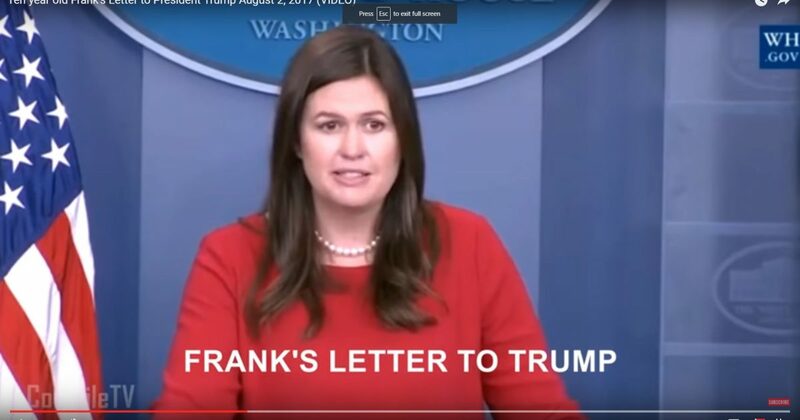 Inspired by the young man’s spirit, President Trump agreed and Frank is on his way to the White House for a tour, and to hang out with the White House grounds crew, and to mow at least a portion of the White House lawn. It would be my honor to mow the White House lawn for some weekend for you. Even though I’m only 10, I’d like to show the nation what young people like me are ready for. I admire your business background and have started my own business. I’ve been mowing my neighbors’ lawns for some time. Please see the attached flyer. Here’s a list of what I have and you’re free to pick whatever you want: power mower, push mower, and weed whacker. I can bring extra fuel for the power mower and charge batteries for the weed whacker, and I’ll do that with no charge.